vanity | Interior Images Ltd. This is somewhat of an interesting item for $375. 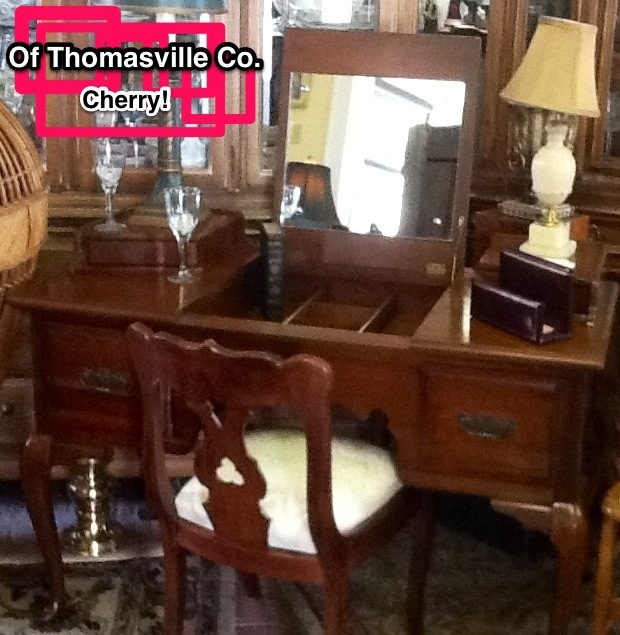 This consigned Thomasville company piece of furniture, of cherry, can easily take on a dual role. When the top is down, it looks like a special species of desk, with mounted drawers in both ends of the desk top, and two spacious drawers below. Lift the top, and a simply mounted mirror stares at you, while below there are various compartments for any dressing instruments you may require the use of. I call it Mr. Darcy’s because the lines and visual mass of this item are formal and manly, and thus quite evident that he would have used such a piece of furniture.